Yunel Escobar homered and drove in four runs to help the Washington Nationals end a six-game losing streak with a 15-6 victory over the Colorado Rockies on Tuesday night. Michael A. Taylor hit a go-ahead RBI single in the seventh inning and the Nationals capitalized on a lack of control by Rockies pitchers in a four-run eighth to turn a close game into a rout. 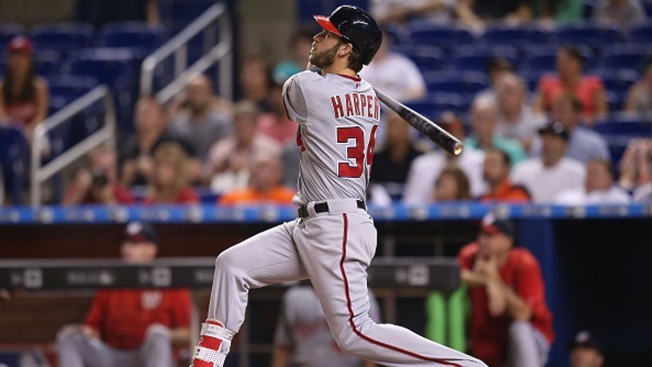 Bryce Harper walked a career-high four times, scoring each time to help Jordan Zimmerman (9-8) come away with the victory despite allowing six runs in six innings. Jose Reyes had four hits, including his first home run as a member of the Rockies. Kyle Parker and Carlos Gonzalez also homered for the Rockies. Gonzalez was lifted in the sixth inning because of inflammation in his right knee and was listed as day to day. Forging the game's third tie, Parker homered off Zimmerman to lead off the sixth but Washington went back in front in its next at bat on Taylor's RBI single off reliever Justin Miller (1-2) who had put a runner in scoring position by issuing two walks. The Nationals drew three more walks - one intentional - that were issued by Tommy Kahnle, and benefited from a balk call on Scott Oberg while batting around in the eighth and tacking on four runs. In all, Rockies pitchers walked 10 Nationals, including two more in the ninth, when they added four more runs. Danny Espinosa doubled for the second time in the game in the fourth, scoring Jayson Werth to snap a 4-4 tie. Washington added another run in the fifth, helped by two wild pitches by David Hale, the second of which allowed Ian Desmond to score from third. Hale, reinstated from the disabled list (groin strain) prior to the game, allowed six runs on eight hits in five innings. Escobar homered in the first following a two-out walk to Harper but Colorado regained the lead in its half of the inning behind Gonzalez's two-run homer and a fielding error by shortstop Desmond leading to an unearned run. Reyes' solo homer in the second was his first since being acquired by Colorado in the trade deadline deal that sent Troy Tulowitzki to Toronto, putting the Rockies up 4-2. The Nationals answered in the third with successive RBI singles by Escobar and Desmond to even it up. Nationals: RHP Aaron Barrett's rehab from a right elbow sprain has been put on hold. Manager Matt Williams said Barrett was visiting with doctors and undergoing a round of tests to try to get a better handle on the problem. ``Last time he went out and pitched, he didn't feel good,'' Williams said. Rockies: Centerfielder Charlie Blackmon was held out of the starting lineup because of illness before entering in the sixth in place of the injured Gonzalez. ... RHP Chad Bettis, on the 15-day disabled list since mid-July because of inflammation in his pitching elbow, was slated to throw 80-85 pitches Thursday in a rehab start for Triple A Albuquerque.